Stuart Byrne believes Derry City got it wrong by sacking Peter Hutton six games before the end of the season. SOCCER Republic analyst and former Shelbourne midfielder, Stuart Byrne claims Derry City made a ‘big mistake’ when sacking Peter Hutton this week. Derry City are just three points off the bottom of the Premier Division table having claimed just 10 points from a possible 30 available from their last 10 games following the mid-season break. The decision to part ways with Hutton came following the club’s FAI Cup quarter-final replay exit at the hands of Cork City on Monday night, however, Chairman, Philip O’Doherty insists it was the 0-2 defeat to Drogheda on September 5th which decided his fate. 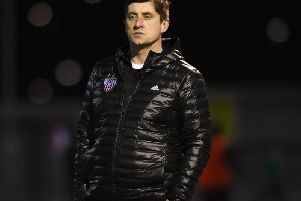 For Byrne, the decision is poorly timed as Derry face just six games to save their season with games against Shamrock Rovers and Cork City coming up next. “You can never be surprised but I think it’s a big mistake,” said the RTE soccer show panelist. “Drogheda was the last league game but they performed quite well against Cork in the first game in the cup and could have won it but were beaten in the replay. “I think just after the midseason break they (Derry City Board) were looking at it carefully and there was a lot of talk that it could have happened then. I could be proved wrong but my initial reaction is that it’s a mistake. You either do it early in the season or don’t do it at all. “But when you make the decision to stick with your manager until the end of the season you have to go with it,” added Byrne. “There had been games where Peter got a response out of his team. Only a couple of weeks ago they got a great result against St Pat’s at Richmond Park. And there has been other results in games where they really turned it on. “At this stage of the season I don’t see the point. I think what they need now is wins. What they don’t need is a manager coming in saying we need to shut up shop here until the end of the season. “I think that could be dangerous for them, running the risk of grabbing some scrappy draws.